I’ve thought about this many times: You gotta love yourself before you can truly love another! I believe this is why many marriages fail and why relationships often crumble. People just do not love themselves! Sure, many people can fool us with their arrogance and elitism! Yet, this is not TRUE love, but an earth-substitute for the real deal! Love does not elevate or separate us from others… Love holds others close and includes. When we do not love ourselves we react differently towards others… often seeking approval, recognition, and affection to fill the void. How can we give what we do not have? The first step in loving ourselves comes from the realization that we are loved. We are loved without condition. We are loved without restriction. We are loved beyond any attempt on our own to love back in the same measure! This love comes from God, a Higher Power without love limits! The peace that comes from learning we are loved in this way is the gift to us. Our ability to then love in a way like never before is our gift to the world! If you struggle with truly loving yourself know that you are loved AS YOU ARE! God is loving you right now! After all, God IS Love. 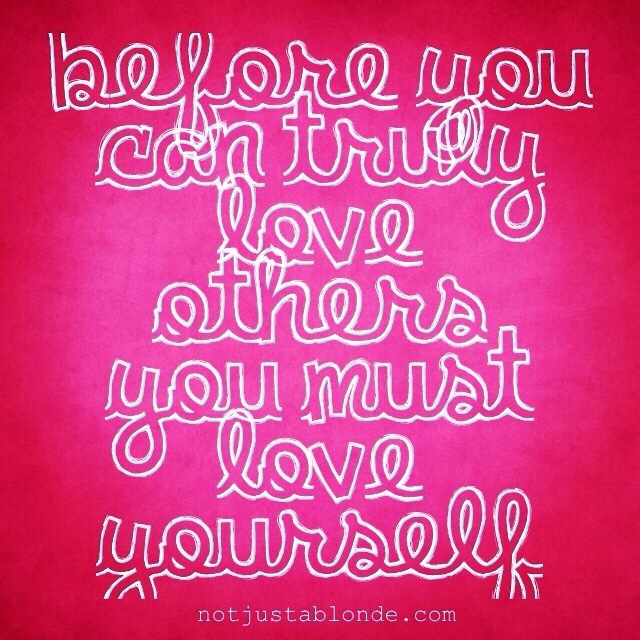 Blonde, I think you have discovered the key to following Jesus’ standard of loving others as ourselves! If we do not love ourselves, then loving others as ourselves will not be helpful. But can begin to love ourselves as we realize the Father’s love for us. Ann, While I agree wholeheartedly with your comments about God’s love for us, it is useful for us to examine why people do not love themselves, and the reason is that they were not loved enough, in some way, as children. This is what makes them feel unloved and unloveable, so they seek for love in whatever way seems right to them, although this may be seen by others as behaving in a way that is needy, gross, or inappropriate. Yes, being loved by our Earthly parents is very beneficial in our learning to love ourselves, and in learning how to appropriately love others. All Earthly parents no matter how amazing will fall short in comparison to the perfect Love of God. In truth there are many people who were raised and loved well by their Earthly parents who still loathe themselves. I find this interesting to examine as well. It has always been sort of a paradox to me! Ann, Someone who loathes themselves, even when they have been loved by their parents, is likely to have been abused by another person during their childhood. Love strengthens, but lack of love, or abuse, weakens. A friend of mine was able (with difficulty) to tell me about being sexually abused by his step-father during his childhood. Despite this abuse, his step-father was the only person who had also showed him ANY real love at that time and it seems to me that it was this which had caused him to be sexually attracted to men.